Meal planning is one of the best ways to wrestle back control of your grocery spending and your eating habits. It’s a method of organisation that few would argue is a waste of time. But, here’s my confession, I just can’t do it. It’s as though a meal plan, like a diet, is the signal for my inner anarchist to go dancing in the sunlight for a while. I see tuna mornay on the menu and inside, I’m thinking, “Again?! But, I feel like pasta…” Usually, I can eat tuna mornay quite happily for breakfast, lunch and dinner – all in the same day. As soon as it looks like I have to eat it… Nope, don’t feel like it. Am I the only one who reacts this way to meal planning? Don’t get me wrong. I enjoy the planning part of meal planning. I’ve put together some awesome looking menu plans over the years. All very clever and colourful. All planned using the meals we love. All abandoned within a day. It’s not the planning that I have an issue with, it’s sticking to the plan. Additional confession: I’ve been told I have commitment issues. They could be right! But, I’ll continue to argue it’s just because I don’t like being told what to do. Even if it’s me doing the telling. 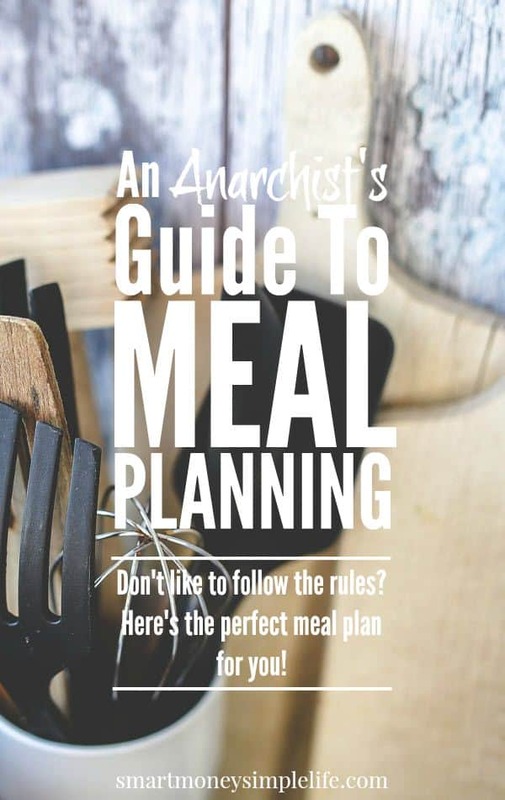 So, how does an anarchist plan meals? My menu planning revolves around a set group of simple meals that rely on similar ingredients. For example, I make a version of chicken parmigiana that we call “paleo parmie”. It’s not really paleo because it has cheese on it and it’s not really parmigiana because the chicken isn’t crumbed and there’s no ham but, the name works for us. Paleo parmie has three basic components: chicken fillet, pureed ratatouille and grated cheese, layered in that order. Those three basic components can also be used for many other meals. The base for minestrone soup. Just add chicken stock, cooked beans, a handful or two of pasta and serve with a sprinkle with parmesan cheese. The filling for vegetarian lasagna. Just layer with lasagna sheets and top with a simple white sauce (roux) and sprinkle with cheese. Bolognese spaghetti sauce. Puree and add to cooked ground beef plus Italian style herbs. Pasta bake. Add either pureed or unpureed ratatouille to the cooked meat of your choice, plus cooked pasta and sprinkle with cheese. Burritos. Add pureed ratatouille to the cooked meat of your choice plus some Mexican style spices and wrap in a tortilla or serve over rice. Curry. Add either pureed or unpureed ratatouille to the cooked meat of your choice and any other vegetables you have on hand plus Indian spices. You can leave out the meat for a vegetarian version. As you can see, this one meal component can create a week’s worth of meals without trying too hard. Apply that same theory to another basic vegetable mix like the one I use for chicken and vegetable soup which uses every vegetable I can lay my hands on (except tomatoes) chopped into small pieces then cooked through. This vegetable mix can be used for soup (with or without chicken) with chicken for chicken pot pies, pureed with stock for a cream of vegetable soup plus used in many of the same ways as ratatouille. When I plan and prepare and freeze these basic components ahead of time, all I need do is ensure there are sufficient extras like meat and cheese for the final meal preparation and I can make a final decision about a specific meal the night before. Shopping is easy and can be done in bulk. Planning is big picture, rather than day by day. Do you meal plan? And, if you do, do you plan right down to the specifics of each meal or do you plan at the big picture level and decide the specifics each day? Meal planning is a nightmare with my husband. He has a really sensitive stomach, and if something doesn’t sound good, he can’t eat it. Well, he can, but it doesn’t stay down. And he never knows what he wants until he’s hungry (and sometimes not even then). I think you’ve come up with a great plan. I’ve given up, personally, and we just keep convenience stuff around. But I think for normal people it’d work very well. Thanks Abigail! Meal planning does sound like a nightmare for you. I guess that’s another reason for keeping things simple but not rigid. Good luck! We’ve gotten to where we have about 5-6 meals that we eat over and over again. It does make it easier! It definitely makes life easier. And, cheaper! When it comes to meal planning, I like having lots of ingredients that can work together in different ways. I’m also lucky in the fact that we like to eat the same things over and over. That definitely helps to cut down on our grocery bill! I meal plan but lately I’ve been rebelling against it too. It saves money on groceries so rest assured those meals will get made eventually, but just because it says we’re having fish Monday doesn’t mean we can’t move it to Tuesday. The most helpful thing is to have the components ready and then make sure that you have something thawed that morning and you’re good to go! YES! I also have problems following menu plans. I have no problem creating them, but I start a revolution every time I try to actually use one. Instead, I simple keep my pantry stocked with everything I need to make all kinds of foods, from soup to desserts. I figure out what I want to make the next day (the most I can stand to plan in advance), I take out whatever needs thawing, and do any prep needed. It’s so much easier and cheaper. I confess, we do plan for a special holiday, but since we usually make the same thing each year–it’s no problem. Good post!